Sometimes I want to change my name to Brooke, because then I could have the best dessert ever named after me: Brookies. 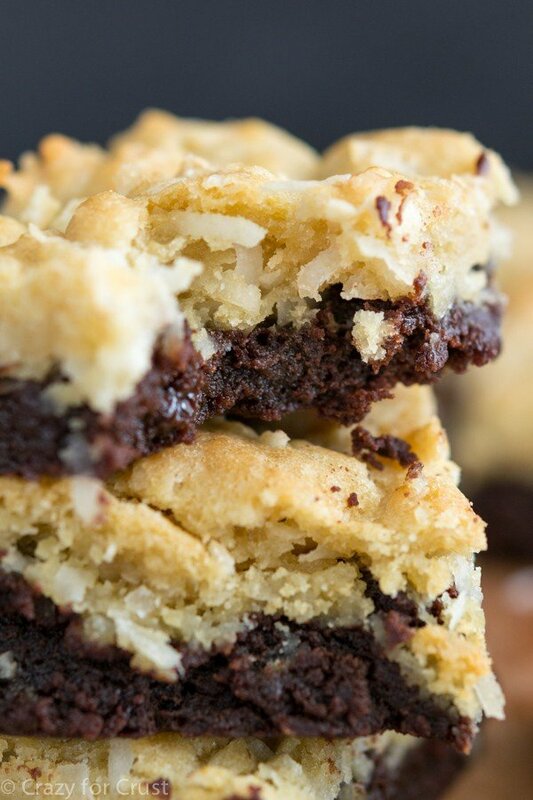 They’re part brownie, part cookie, and all super decadent. Oh, I’m sorry. Your keyboard is full of drool now, isn’t it? If only computer screens were scratch and sniff. Better yet…if only computers were like those food machines in Star Trek: The Next Generation. “One Coconut Brookie please,” you’d say to the wall. And the wall would shimmer and then a plate of these would appear. That would be amazing…but then I’d be 1000 pounds. 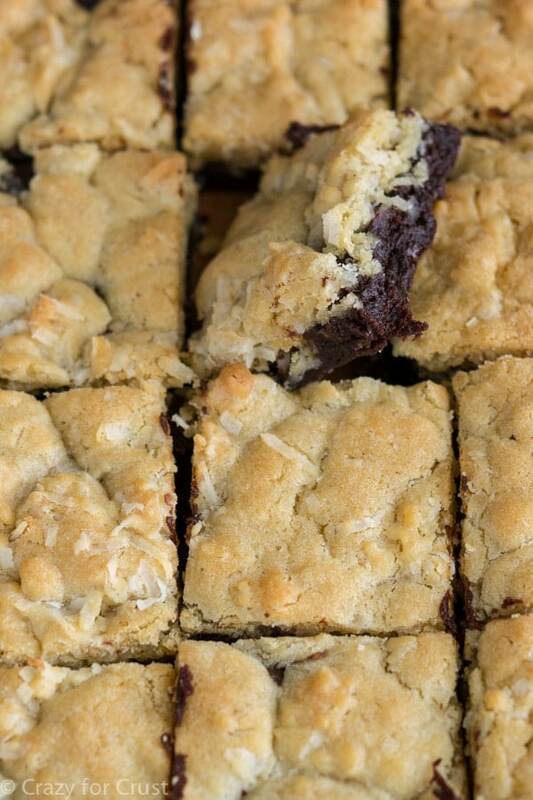 These bars are a marriage of two of my favorite things: Brownies and Coconut Sugar Cookies. Food marriages are my favorite things ever. The ones that make me happiest? Include brownies. I’ve married brownies to peanut butter cups, potato chips, cookies, and mini pies. And now? I’ve married them to my other love: coconut. This recipe is quite easy, but it does make a little bit of a mess. Two layers = two bowls. But they’re worth it! The first thing you have to make are your brownies. I used my favorite recipe for fudgy, ridiculous, decadent brownies. That recipe uses three kinds of chocolate (cocoa powder, unsweetened AND semi-sweet baking chocolate) and lots of butter. Lots of chocolate + lots of butter = very good brownies. The brownie batter gets spread on the bottom of a 9×13″ pan. Then you move onto layer #2: the coconut cookie layer. I’m so in love with coconut it’s not funny. I weep for the years I told myself I “hated” coconut. I was in my 30s before I relented and admitted I was very, very wrong. Oh, how many desserts I turned down because of my false hatred for something so wonderful. Toasted coconut should be it’s own food group, just saying. 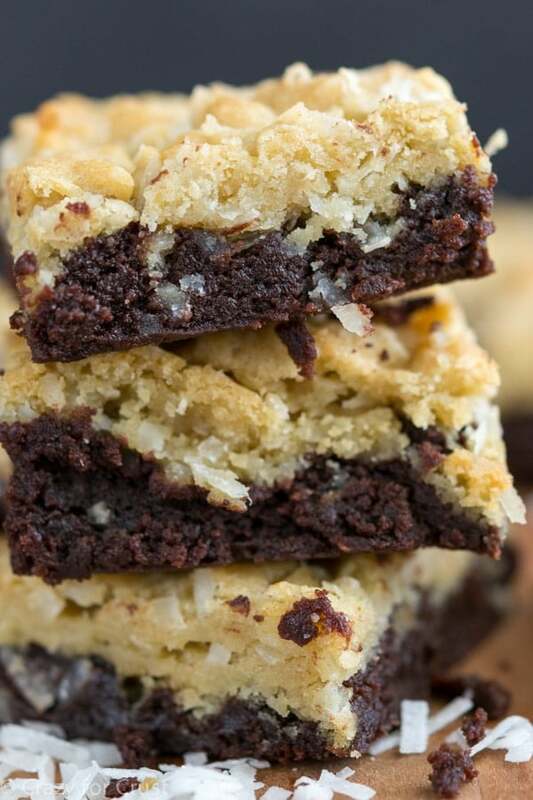 I used the recipe for my sugar cookie bars to inspire the coconut layer of these brookies. 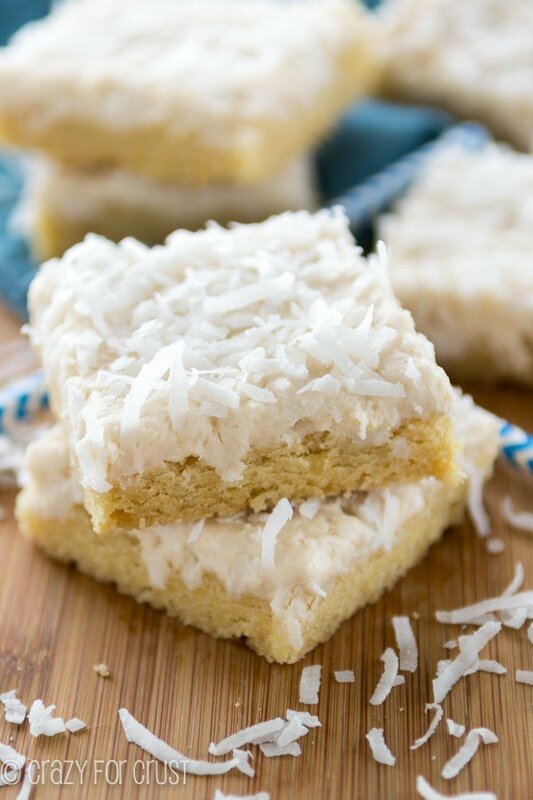 The key to the coconut flavor in the cookie layer is to not only add shredded coconut, but to also add coconut extract. It really pumps up the coconut flavor. 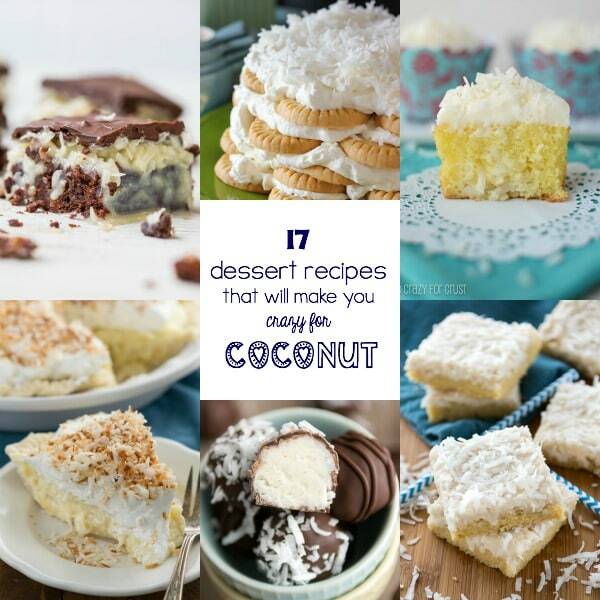 Plus, coconut and chocolate were meant to be together. Have you ever tried an Almond Joy? Totally true love. Just like I have for these bars. 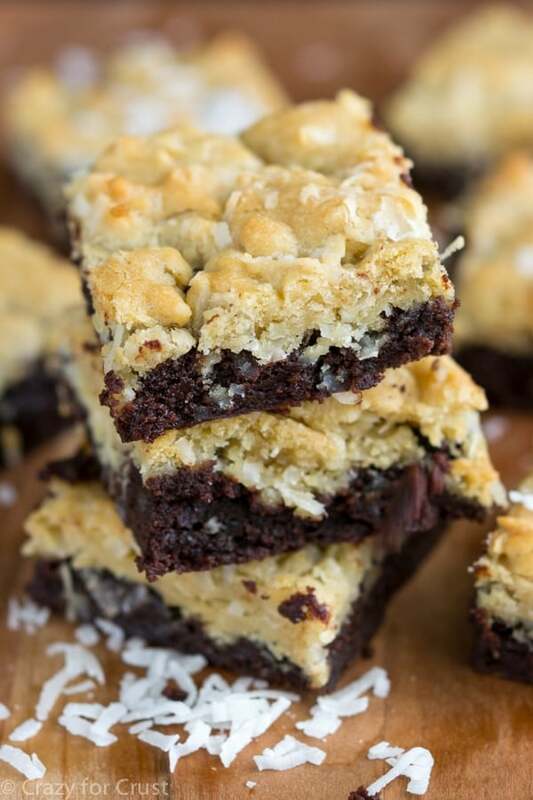 These Coconut Brookies are a SERIOUS bar cookie brownie combination! 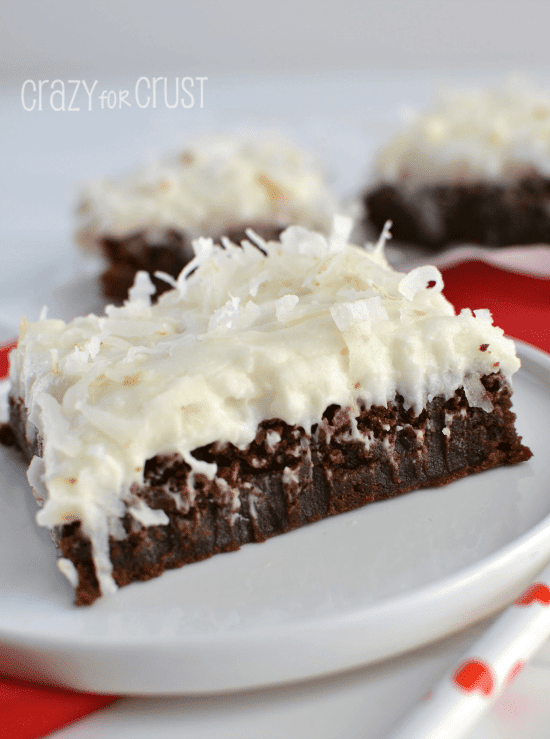 These fudgy brownies topped with coconut sugar cookies are perfect for a crowd! Preheat oven to 350°. Line a 9x13” pan with foil and spray with cooking spray. Make the brownies: Place the two baking chocolates and butter in a large, microwave safe bowl. Heat on HIGH power for 2-3 minutes, stirring every 30 seconds, until chocolate is smooth. Stir in sugar. Add eggs, vanilla, and cocoa and stir well. Add flour and stir carefully. Make the cookies: Cream together butter and sugar in the bowl of a stand mixer or in a large bowl using a hand mixer. Mix in egg, extracts, baking soda, cream of tartar, and salt. Stir in flour, then stir in coconut. Spread brownie batter in prepared pan. Scoop tablespoons of cookie dough, flatten slightly with your hands and then lay over the top of the brownies. It’ll be hard to spread because it’s thicker than the brownie batter, so it’s best to drop flattened tablespoons evenly over the batter and then press lightly with your fingers to adhere them to each other. Bake for 30-40 minutes until the tops are dark golden. If you test them with a toothpick the brownies won’t be totally done, so just take them out once the tops are dark golden in color. The brownies will cook more as they cool but they will be super fudgy! Cool completely before cutting into small bars. These are some serious brookies - a little goes a long way! WOW – these look awesome! I would like to incorporate toasted almonds…Any suggestions? 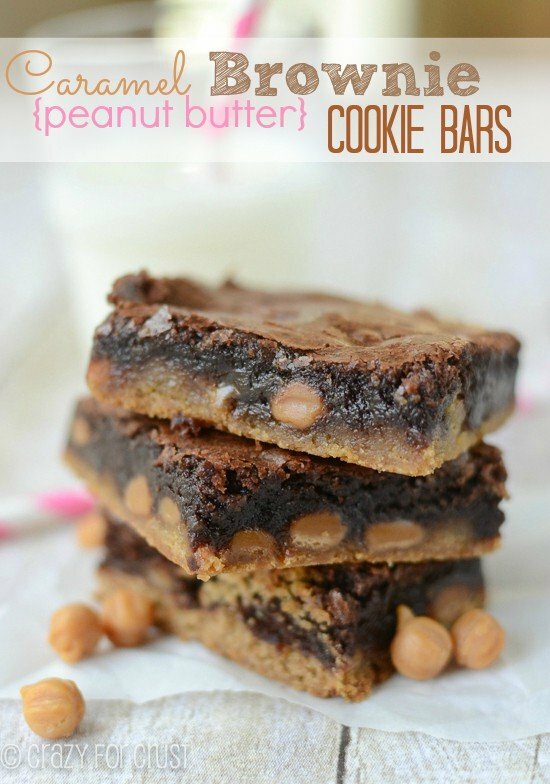 I’d mix them into the cookie dough part! This is the second time I attempted this recipe. Both times the cookie on top came out perfectly but the brownie, with the exception of the very outside edge, was raw. I tried covering the top with foil and baking a bit longer, but it made no difference. Will not attempt again. It was a waste of ingredients.